Scientists this week got their first close-up look at the big new iceberg that’s calved from Pine Island Glacier (PIG) in the Antarctic. The block, which has the designation B-46, initially covered 225 sq km. Given the fashion in recent years to compare such bergs with the area of Manhattan Island, that would have made this one roughly three times the size of the famous district in New York. 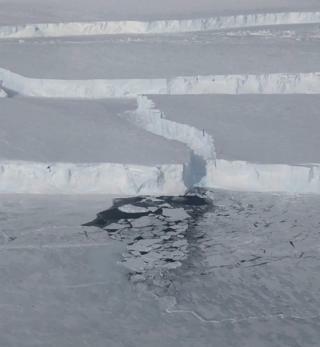 But the Nasa over-flight on Wednesday shows the berg is already breaking up. The US space agency DC-8 was on a routine expedition as part of the IceBridge project, which measures the elevation of ice surfaces with a laser. Researchers onboard were able to point their cameras out the windows of the aircraft and capture some of the scale and beauty of the frozen scene below. The PIG drains a vast area of west Antarctica that is roughly equivalent to two-thirds the area of the UK. 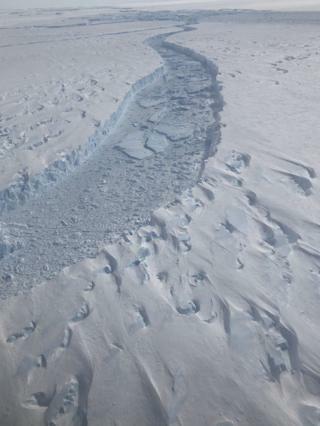 The glacier regularly calves large chunks from its floating front, or shelf, which pushes out into the Amundsen Sea. This particular berg came away in October and was first noticed by satellites. 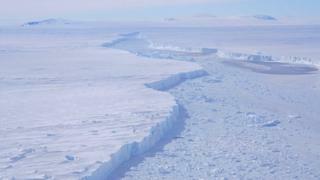 The production of bergs at the forward edge of an ice shelf is part of a very natural process. 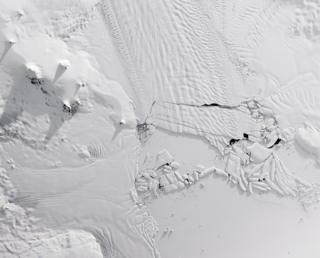 It is how a glacier system like Pine Island maintains equilibrium: the ejection of bergs inevitably follows the accumulation of snowfall inland. That said, the PIG has come under close scrutiny because it has shown evidence of thinning and acceleration. Long-term satellite studies indicate that it has been dumping considerable volumes of ice into Amundsen Bay, pushing up global sea levels. The name of the new berg comes from a classification system run by the US National Ice Center, which divides the Antarctic into quadrants. The A quadrant covers the Amundsen Sea sector, and this block is the 46th in the series. It – and any large daughter blocks – will need to be tracked because of the potential hazard posed to shipping. B-46 is dwarfed by the mighty A-68 berg, which broke away from the Larsen C Ice Shelf in 2017. It covers an area approaching 6,000 sq km.